The locals in this part of Toronto are very proud and just as patriotic as the Italians in Little Italy. With the two neighbourhoods in close proximity, soccer events become a little competitive as fans try to prove who is the most nationalistic. When in Little Portugal, be sure to have some “Churrascu”; traditional barbeque chicken doused with hot “piri piri” sauce. After sampling this local favourite, stop off in one of the many bakeries that line the streets and treat yourself to some “Natas” (traditional Portuguese custard tarts). A street called “the Danforth” has become synonymous with great Greek cuisine and all that is Greek. This neighbourhood has Greek restaurants and bars lining the Danforth and plenty of locals gather here to meet with friends, have some Souvlaki for dinner and some Baklava and strong coffee for dessert. Around August, Danforth is closed off to traffic to host the annual”Taste of the Danforth Festival”, where thousands gather on the streets to sample various culinary delights and enjoy the neighbourhood as it was meant to be discovered – on foot. Toronto’s Chinatown is one of the largest in North America. Whether you are looking for traditional Chinese cuisine or are shopping for a very exotic Asian ingredient to satisfy the gourmand in you, Chinatown has plenty of options. Here you will find Peking Duck hanging from the windows and plenty of outdoor markets. Yorkville is known for designer shopping, the best upscale restaurants in the city and plenty of celebrity sightings. Here you will find Chanel, Louis Vuitton, Escada, Gucci and plenty of other designers to add to your wardrobe collection. With designer shopping comes designer cuisine. Some of the best chefs in the city have gathered in this neighbourhood in an effort to attract hungry shoppers during the dinner hour. If shopping has tired you out, be sure to visit one of the many luxury spas that are sure to please those who need some pampering. In just the past few years, The Distillery District has become one of the most romantic and enjoyable destinations in the City.The Distillery District is Toronto’s first pedestrian only village. From the brick lined streets to the European piazza styled areas, The Distillery District is a great place to unwind and slow down for the day. Like Soho in the 1960’s, The Distillery District has become an area associated with creative thinking and expression. The area’s rebirth has been dedicated to promoting arts, culture and entertainment. Over the past few years this new landmark has been host to internationally acclaimed galleries, artists, theatres, restaurants, cafés and boutique retailers. The St. Lawrence Market Neighbourhood is the historic heart and soul of Toronto. This area of Toronto offers everything from fine dining to farmer’s markets, and a lively night life enjoyed in the same historical surroundings once occupied by Toronto’s founding fathers. Located in historical Old Town Toronto the St. Lawrence Market Neighbourhood Business Improvement Area (BIA) includes theatres such as the Sony Centre, the St. Lawrence Centre for the Arts, and numerous historical properties and landmarks including the north and south St. Lawrence Markets, (host of the Saturday morning Farmers Market for 200 years). Dundas Square is a unique focal point of the downtown Toronto community. The Square is designated for use as a public open space and as an event venue that can accommodate events of various sizes. You’ll discover a wide range of activities on the Square: community celebrations, theatrical events, concerts, receptions, promotions – events that appeal to residents and tourists alike and provide a showcase for local businesses. If you want to sit back relax and surf the net, Dundas Square boasts one of the hottest Wi-Fi spots in the city. There is no shortage of tourist attractions in Toronto. Places like the CN Tower, The Rogers Center and The Air Canada Center are must see venues. 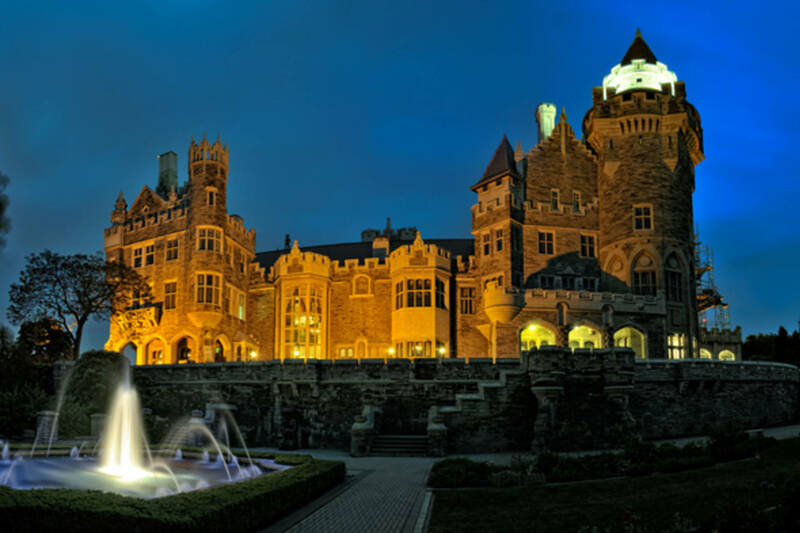 For hockey fans, be sure to visit the Hockey Hall of Fame and for those who like castles, Toronto has Casa Loma.